Prahost offer a range of fast and reliable Intel processors with choice of RAM selection from 4GB to 256GB and SATA to SSD disks, we also offer amazing special deals every week that you can enjoy! With PraHost Netherland Unmetered Servers you will get maximum bandwidth at most cost efficient rates along with no risk of overuse charges. You get unrestricted access to bandwidth with all our unmetered servers in netherlands. We have three completely furnished and up-to-date datacenters EvoSwitch AMS1 in Haarlem , Dataplace in Alblasserdam and SmartDC in Rotterdam, Netherlands which are equipped with state-of-the-art branded hosting equipment and routers. You can never go wrong with PraHost Netherlands Unmetered servers as all our servers come with enterprise-level network quality and first-grade hardware support at no added or hidden costs. We offer a range of fast and reliable Intel processors with choice of RAM selection from 4GB to 256GB and SATA to SSD disks. Our dedicated servers are compatible with all kinds of Operating Systems with the most common ones being Linux and Windows. Reason to choose Unmetered Bandwidth Servers? 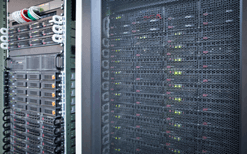 Unmetered servers offer you unlimited bandwidth, only limit is server's bandwidth port. We offer 10Gbps, 1Gbps and 100Mbps bandwidth ports, which will automatically put a cap on the maximum bandwidth that can be availed, thus negating the risk of overuse charges. PraHost offers best network connectivity due to our associate connections with leading telecom carriers in this industry. 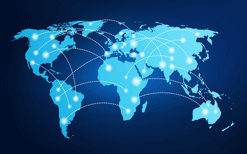 These telecom providers have several data centers all around Europe and United States. Not sure which netherlands unmetered server will give you the best performance? click on chat with our specialist.